The Philippines independent human rights watchdog has said it will investigate claims by President Rodrigo Duterte that he personally killed drug suspects while mayor of Davao. The Commission on Human Rights will also examine reports that so-called death squads killed several hundred people in the southern city. 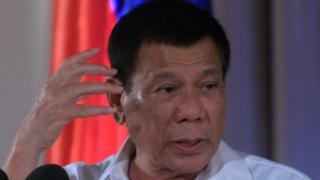 Mr Duterte confirmed to the BBC last week that he shot dead three men. Since being elected in May, he has waged a brutal anti-drugs crackdown. Critics say he has encouraged police, vigilantes and mercenaries to shoot suspected drug dealers and users on sight. Nearly 6,000 people are said to have been killed. Mr Duterte was mayor of Davao for two decades, during which time he earned a reputation for harshly suppressing crime and was accused of sponsoring death squads. On Tuesday, UN High Commissioner for Human Rights Zeid Ra'ad al-Hussein said Mr Duterte's claims "clearly constitute murder" and he called on authorities to investigate. Chito Gascon, who heads the Philippines Commission on Human Rights, said on Wednesday a team of investigators would look into the matter. He told the BBC that a previous investigation into events in Davao, that concluded in 2012, had not found any evidence that Mr Duterte was directly involved in killings but the commission had recommended charges be filed against him "under the doctrine of command responsibility". Prosecutors, however, had not taken up the recommendation. "Now, with his admission... we are looking into new evidence that directly links Mr Duterte to the killings," he told the BBC's Newshour programme. Mr Gascon added that Mr Duterte was immune from prosecution while in office. But he added: "Even if we cannot file charges while Mr Duterte is president I think it is important that we do have a record and documentation [of events] so that at the time of appropriate reckoning we have the evidence preserved so that people may ultimately be held to account for what they have done." Earlier this month, Mr Duterte told a group of business leaders that in Davao "I used to do it [kill] personally. Just to show to the guys [police] that if I can do it, why can't you". His spokesman later dismissed the comments as "tough talk" and denied that Mr Duterte had killed anyone. But speaking to the BBC hours later, Mr Duterte said: "I killed about three of them... I don't know how many bullets from my gun went inside their bodies. It happened and I cannot lie about it." One of the president's most strident critics in the Philippines, Senator Leila de Lima, has said his admission could be grounds for impeachment. But on Wednesday, the government filed criminal charges against Ms de Lima, accusing her of trying to sabotage a congressional investigation into her alleged involvement in the drugs trade. She strongly denies any wrongdoing. Earlier this week, Ms de Lima told the BBC that she feared for her life, but will not be silenced. Mr Duterte has dismissed concerns over his anti-drugs policies.